One component white cementitious adhesive product that is fortified with acrylic resins and specially selected, low water absorption aggregates. Suitable for indoor and outdoor installations over sound substrates: •Waterproofed surfaces with brushable cementitious or elastomeric waterproofers. •Wall surfaces made of concrete, plaster or prefabricated concrete. •Over floor surfaces with radiant heating systems. •Roofs and balconies. •Areas with constant presence of moisture, such as fountains, bathrooms, showers etc. •Mosaic or tile refurbishments in athletic and swimming pools, heavy traffic areas, etc. 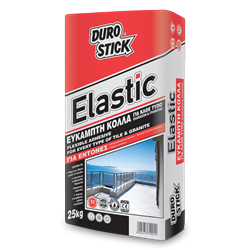 ELASTIC ensures the installation of all types of ceramic tiles and stones with minimal absorption, such as: •Ceramic tiles of all shapes and sizes. •Glass mosaic, klinker, glazed gres. •Cotto, honed marble, artificial stones. •Any type of granite tiles, absorbent or not. •Cork and expanded polyurethane boards. •Every type of marble, even green marble. Classified C2TE S2 per EN 12004 and EN 12002.